Today marks the first anniversary of the day that shook the music world to its core - the shocking passing of Michael Jackson. Those of you that have picked up the latest issue of Rhythm will have seen our full ten-page The Drummers Of Michael Jackson tribute, and today we are further honouring the icon by looking at Michael Jackson's Career In Beats. This live version of the 1991 hit tells you all you need to know about Michael. A great song, unbelievable dance moves and an absolute ton of charisma. Oh, and a real fat backbeat courtesy of Ricky Lawson. If you think the onstage action is special, just check out the pandemonium in the crowd. You can count the number of acts that can draw this kind of reaction from their audience on one hand. Jonathan Moffett is behind the kit for this one (which was filmed during the HIStory tour) and he brings an almighty groove to the track, with the snare roll finale a particular favourite of ours. 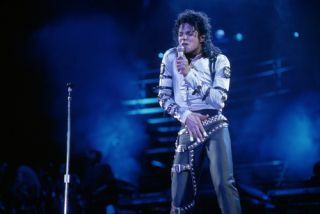 Michael is also on top form, working for every second of the song. Check out the video above and you'll be singing this one for the rest of the day. This video from Michael's Wembley Stadium show on 1988's Bad tour sees Ricky Lawson back at the drumstool. The sticksman puts in a sizzling performance as Michael again shows why he was such a superstar. Cue more screaming fans, phenomenal chorography and an incredible performance. A youthful-looking Michael puts in a performance that exudes star quality throughout in this 1988 live version of 'Thriller'. The backbeat is solid as a rock yet as groovy as hell as Michael busts out the dance moves that would influence a new generation of pop icons. Another signature Jackson tune (how many of those did he have?! ), here we see a knockout performance that exemplifies Michael's bigger-than-life school of showmanship complete with a recreation of the gang fight from the original video. Breathtaking stuff. For more on Michael don't miss our ten-page Drummers Of Michael Jackson feature in the latest issue of Rhythm. You can order yourself a copy here.